We have used “Scripture” and “Old Testament” interchangeably. That is because the books Paul called “Scripture” are roughly equivalent to what we call today the “Old Testament.” The phrase “Old Testament” is, of course, a Christian expression inspired by Paul’s discourse (2 Cor 3:14). Many scholars refer to this collection today as the Hebrew Bible because of the pejorative connotation of “old” in OT. But Paul didn’t use either expression; he used the word graphē (translated “writings” or “Scripture”) to refer to the collected, sacred writings of Israel. Paul encountered the Scripture primarily in the synagogue. The synagogue served not only as a center for worship; it also provided the meeting place for boys and men to study Torah. Literary references in the period to Scripture refer to the law, prophets and the rest of the books (see the prologue to Sirach). This indicates that the threefold division of the present Hebrew Bible has ancient roots. Since the Scripture was written in Hebrew, Aramaic-speaking Jews needed it translated into their language. These translations took place at first informally after the Hebrew text was read in the synagogue. Later generations of Jews formalized these translations and codified them in the Aramaic targums. A similar procedure likely produces the Greek versions that distill eventually in the Septuagint (LXX), the standardized Greek Old Testament version used by early Christians. Close analysis of Paul’s quotations and allusions to Scripture demonstrate that the apostle depends more heavily on Greek versions than Hebrew. Although he referred to himself as a “Hebrew of the Hebrews” (Phil 3:5), the fact that he writes his letters in Greek may account for some of his dependence on the Greek versions. 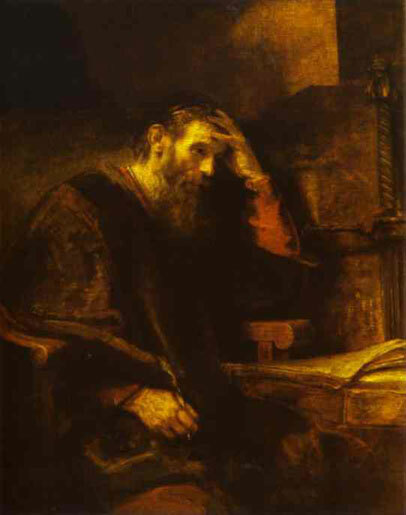 An earlier generation of scholars addressed the issue of whether Paul’s OT citations were closer to the Hebrew masoretic text or the Greek Septuagint. They assumed that Paul drew from standardized Greek and Hebrew texts. The variations in the quotations from those standardized texts were interpreted as memory lapses or Paul’s interpretive comments. Recent work has set aside this working assumption and shown that the Hebrew and Greek biblical texts were not standardized at this time. In particular, the biblical manuscripts founds among the Dead Sea Scrolls exhibit the fluidity of the textual tradition within a single community’s library. Obviously there is no one way Paul introduces a scriptural citation. In some cases there is no introductory formula even when quoting a passage explicitly (e.g., 2 Cor 10:17; Gal 3:11-12). Parallels to Paul’s introductory formulae in later rabbinic texts suggest that the apostle’s practice of quoting Scripture is not unique. He stands within the stream of Jewish exegesis. The Letter of Aristeas is a legendary account of the origins of the Septuagint. It tells the tale of seventy scholars summoned to Alexandria by the king to produce a systematic translation of the Pentateuch in the 3rd century BC. It is more likely that the Greek Old Testament developed in three phases: (1) extemporaneous oral renderings of the Hebrew into Greek are (2) later standardized before they are (3) written down. Even after being written down, however, the textual tradition remains fluid. Perhaps a fourth phase is the standardization of the written text. For example, E. C. Ulrich,”The Qumran Biblical Scrolls—The Scriptures of Late Second Temple Judaism,” in T. H. Lim (ed. ), The Dead Sea Scrolls in their Historical Context (Edinburgh: T. & T. Clark, 2000), pp. 67-87. By David B. Capes in Uncategorized on May 27, 2013 .